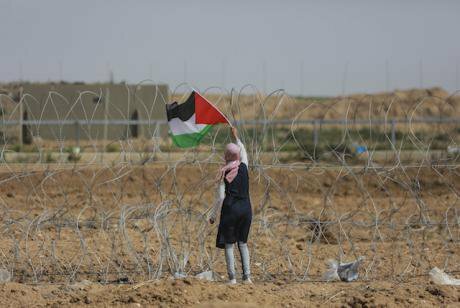 A Palestinian girl waves the Palestinian flag along the Israel-Gaza border, in Gaza City, 27 April 2018. Picture by: Wissam Nassar/DPA/PA Images. all rights reserved.Seventy years ago, more than 170,000 Palestinian from historic Palestine were forced to leave their homes, villages, cities and lands, as refugees to the Gaza Strip. They were part of the 710,000 Palestinians who were forced to leave, seeking refuge in Gaza, West Bank, Lebanon, Syria, Jordan and elsewhere. The images of elderly people and kids fleeing the killings of the Zionists gangs and militias in 1948, still occupy the vivid memories of Palestinians as well as comprising the visual identity of the Nakba (Catastrophe). Today, after seven decades, the grandsons and granddaughtersof those refugees are making their way back to their villages. They have never seen their villages, homes or land, but they kept the memories of their grandparents, linking their identity to their villages, vowing to return to their homes, relying on the international recognition of their right to return, and the moral responsibilities of their right. The Great Return March (GRM) is not solely a protest against the ongoing siege of Gaza, and the increasingly severe humanitarian crisis, but rather it is a protest against the Nakba, that has been ongoing since 1948. The young generation of Palestinians know that the current humanitarian crisis and the disintegration on the Palestinian system is a result of the Nakba, as well as thedehumanization and the apartheid that is institutionalized against the indigenous people of Palestine. Therefore, any discussion on the GRM should consider the protests as an action and a reaction. Action against the ongoing imprisonment of 1.8 million Palestinians in the Gaza strip for more than ten years, and a reaction to the apathy of the international community. According to the United Nations Office for the Coordination of Humanitarian Affairs, forty Palestinian civilians were killed and 5511 were wounded since March 30. Two journalists were assassinated deliberately by the Israeli forces, despite each bearing a clear sign that they are journalists. In addition to this, hundreds of the wounded were children and minors. Each of the forty people who scarified themselves had a story to tell, and a mission to accomplish. They were humans, who loved, and were beloved bytheir families, friends and relatives. One of those killed was Mohammed Ayoub, 15 years old from Jabbaliya, who was shot in the head in front of cameras, without threatening or causing any harm to the Israeli Army. In his photos there is one where he drew aheartbetween his initials and those of another person. He did not think that he would be a target ofan Israeli sniper who might have even cheered after shooting a civilian, as one video showed soldiers cheering as they were shooting at civilians. Mohamed died and left a story to remember. Another person killed was the beloved journalist, Yasser Mourtaja, who was well- known in Gaza for his kindness tochildren and his professionalism as a photojournalist. Weeks before he was killed by the Israeli snipers despite wearing a vest marked by “PRESS”, he was awarded a USAID fund for his media organisation. A third person lost was the artist Mohamed Abu Amro, who was shot in the head while participating in a nonviolent protest on the eastern borders of Gaza. 19 year old Abdulfatah Abdulnabi was running away from the fence between the besieged Gaza Strip and Israel, when an Israeli sniper shot him dead. A video published by the Israeli media shows how the Israeli soldiers and army view the Palestinians. The video shows an Israeli Armyofficer asking one soldier to “shoot the guy in blue”, but the soldier tells him that he will take the one in red. This interaction shows how the Palestinians have been dehumanized by the Israelis, with the removal of their names, history, families, and humanity. The video illustrates the approach of the Israeli Army which sees millions of Palestinians as objects rather thanhumans. It is evidence that the conflict is not only about freedom, but also aboutlife. This killing doctrine and the dehumanisation of the Palestinians can be seen clearly in the words of Israeli defense minister, Avigdor Lieberman, who said after nine Palestinians were killed that there were “no Innocent people in Gaza”. The population of the Gaza Strip that has been under intense siege since January 2006 and has been suffering enormously. Since the early 1990s, Israel imposed movement restrictions on the Gaza Strip, where 1.8 million people live, making itone of the biggest open air prisons in the world. In 2015, a UN report warned that, under the current conditions, the Gaza Strip will be “uninhabitable” by 2020. However, it is 2018, and the Gaza Strip is already uninhabitable. The ongoing Israeli blockage, and the sanctions imposed by the Palestinian authority against the Gaza Strip, was the result of failed reconciliation efforts with Hamas. Since then the economy and life in Gaza has been crippled, with suffering growing rapidly. In 2015, the GDP in the Gaza Strip was 971 USD, while it was 5754 USD for the same period in the West Bank. Comparatively in Israel it is at 44,019 USD. The unemployment rate in the Gaza Strip and West Bank reached 26.9% in 2016, with Gaza hardest hit at 41.7% unemployment compared to 18.2% in the West Bank. Yet, the real numbers of youth unemployment in Gaza have reached more than 75%. This shows the inequality that the Palestinians suffer compared to Israel, and also how the Gaza Strip is suffering from huge inequality compared to the West Bank. The Palestinians in the Gaza Strip are walking through a dark tunnel, with no end in sight. They are stuck between the hammer of the Israeli apartheid and the anvil of Palestinian political parties. This reality pushes them to take the lead and organize nonviolent protests, shifting attention to the real cause of the problem, which started in 1948. The youth of the Gaza Strip are rising up in the face of Israeli colonialism, and the status-quo, as well as an act of rejection ofthe political parties in the Gaza strip, including Hamas and Fatah. The youth in Gaza struggle for their dignity, and prefer to fight for life and die in dignity, rather than die slowly from the blockade.